The field of design is so wide and bigger that anyone can get vanished into this timberland of ingenuity, and this is true when you start of your career into art & design, you will see yourself totally riveted by the tides of projects. You get to shed your sweat, you get to bear the brunt, you get to probe for the design possibilities, you need to work on resourcefulness and you get to make an environment which is healthy for the colleagues as well as for you. Of course it is so colossal that the demands from the artists and designers are gigantic, and one really has to outdo oneself in order to make his both ends meet and to provide the clients with the best positive results, one must put forward the finest ‘end product’ to avoid confusions. It is said, when you are good at something, never do it for free, because you are earning out of your hard work and because of all the exertions that you have put behind it. Have you ever seen an app developer making a free app for the client? Well not really; neither a writer will provide you a free content for the blog. So yes, you never put yourself free or at discount rates for your hard work. But here I am providing you something free to use, like a bonus for all that you have been doing in your life. Ha-ha, jokes a part, it is a mockup for the designers/app developer. 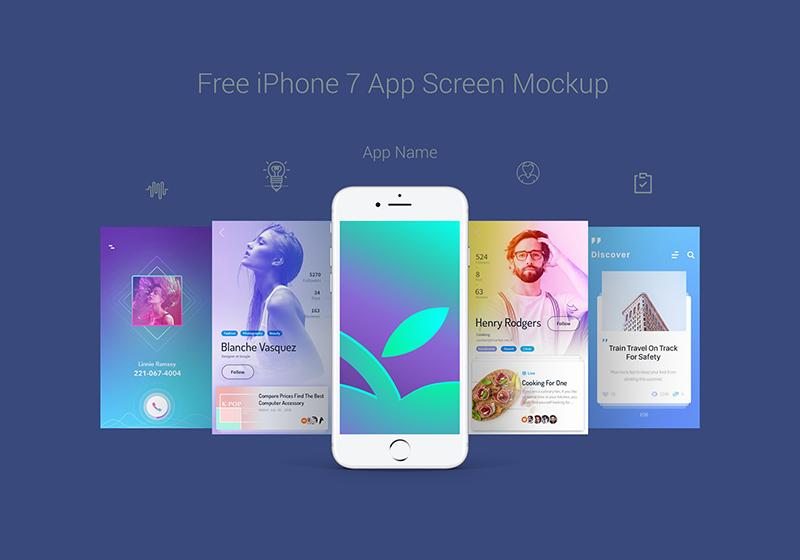 Check out this free premium iPhone 7 app mockup design. Insert in your application user interface and show it off straight to your client that how his app will look in iPhone 7. I am sure it will build up a good stance and a professional impression before your client. Also check out the other mockups we are doing for assistance. For more amazing design and art dose, don’t you forget to subscribe to us. Here we go with a bang to come right back again.